Today’s post is from APW writer Megan. After watching the latest Frumpy2Fab video I posted on my YouTube channel she emailed me about an idea she had for a post. The thing about her idea was that I was feeling the same way she was that morning which you’ll read about in a second, and I thought about sharing my feeling with you but I knew I wouldn’t have time to take pictures and write a post after the video. So when Megan emailed me with her idea, I knew it was God bringing me what I needed and using me to encourage, inspire and ignite Megan’s passion for being her best. I hope Megan’s post and my video does the same for you. Don’t forget to check out the challenge at the end of this post. This morning was nothing out of the ordinary. I jumped out of bed, made coffee and breakfast for my family, and got my son and husband out the door on time. Perfect. Then I made my own breakfast and sat down to read my devotions and look over a few blogs that I follow when I came across Saidah’s Frumpy2Fab January 2013 video. I figured I would watch the video while I finished my coffee before starting on school work for the day. As I am watching, I look down at my robe and pajama pants and start to feel a bit convicted. 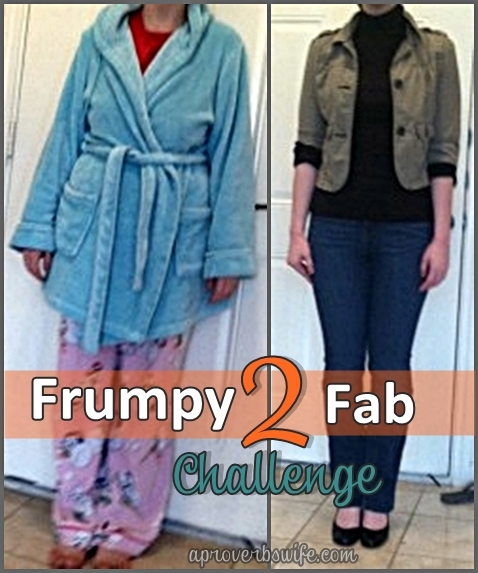 I have said so many times that I should try the Frumpy2Fab Challenge, but I never have. Those are the thoughts that normally flow through my head when I see the Frumpy2Fab posts. Then I picked out some clothes, got dressed, and had him take another picture. Nice, right? I think I look a lot better, and I am sure my husband will too! Ok… so I thought to myself… I feel better. Now I can send these pics to Saidah and move on with my day… I sat down to crop the photos and decided to cut my head off. I mean the point is really about the clothes right? I got dressed! Yay! BUT… then God convicted me again… if I am not willing to show my face here… if I would be unhappy with my face when showing all of you, people I don’t know… why am I showing that face to my husband? Now don’t get me wrong… he thinks I am beautiful without makeup, but that’s not the point. It’s not my best. I am not taking pride in looking my best for him. So… as I take a deep breath and humble myself… here is my before picture this morning. This is how I look most mornings. Alright, now that that’s done… I can put my face on! Now I don’t have much makeup, and most of what I do have is either a sample or freebie I picked up somewhere, but we have to work with what we have. I also am trying to grow my hair out so it’s in one of those funky “I don’t know what to do with you!” phases, but again, this is about OUR best. Not someone else’s. Not about wishing we had more or something better. Ahh… now I actually feel good and ready to start my day. No cutting corners here! I feel so good I think I might just take a pic and text it to my hubby to say I love him. It’s amazing what a little time and effort can do to make you feel your best and show your honey you love him. You can do this! Give it a try! Just one day at a time, and give it YOUR best. Feel like encouraging other women to try this challenge? Why not post your before and after pics on the A Proverbs Wife FB page? I’d love to see you there! I really need to do this! I have been saying the same thing all month and haven’t really done it :/ Thanks Megan! @Arelis Cintron, it’s so easy to talk ourselves out of it! Trust me, I know! Sometimes planning ahead can help… like try setting out a cute outfit the night before with shoes and everything. Then in the morning just jump up and get ready before you have time to talk yourself out of it 🙂 You can do this Arelis! @Megan, I CAN do this! Thanks Megan! It is amazing how much better you feel when you get put together for the day. You look great Megan! Thank you Sheri 🙂 You’re right! Saidah’s challenge can apply to all women of all ages. God made all women beautiful in their own way. Now it’s up to us to glorify Him with what He gave us! Thank you Brandi! If you’re up for it, feel free to post your Frumpy2Fab pics on the FB page! You look great and I love Saidah’s challenge. The message is even great for someone who is not yet married. A little effort goes a long way and it helps in making you feel more confident. Your eyes sparkled in your “after” pictures. More than anything else, I suspect that the sparkle is what your husband will love.